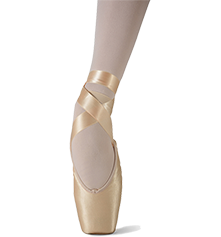 The unique Diva pointe shoe by Merlet is handcrafted in Limoges, France. It features a polycarbonate shank for durability, so no breaking in is required. A special box paste developed by Merlet adds extra comfort, and they come complete with ribbon and a pointe shoe bag.